An entry in the 4th OROW (One Room One Week) competition. It's VERY short. (Update 23/11/06) Heartland Deluxe has now been released and is available for download! (Update 22/9/06) Further information has be added to the GiP thread, and the release date has been finalized as October the 18th 2006. (Update 18/8/06) As the release of Heartland Deluxe gets nearer, I've stared a Games in Production thread on the forums, and all further information can be found there. (Update 18/7/06) Heartland will shortly be replaced by Heartland Deluxe, which will feature among other things: An Inventory! Puzzles! Character Interaction! And...more! Watch This Space! 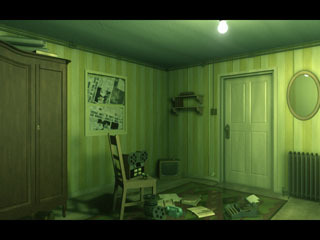 I love creepy games... please make the continuation sequel.